A HUMBLE BEGINNING. In 1967, Jose C. Olivares, a Chemistry professor-entrepreneur and his son-in-law Dr. Vicente M. Santos, a physician, founded Our Lady of Fatima Hospital in Valenzuela, a former municipality of Bulacan. The hospital immediately became the primary provider of medical and health care services for the residents of Valenzuela. Mr. Olivares, who was then a professor at the Ateneo de Manila University, envisioned a dream for Fatima. He set his eyes in transforming the Our Lady of Fatima Hospital from a general hospital to a medical complex that will be the training ground for health care providers such as nurses and midwives. Thus, in 1973, the Our Lady of Fatima College of Nursing was established. And in 1976, the first batch of Nursing graduates garnered an unprecedented 100% passing average in the Nursing Board examinations. As a result of the growth in enrollment in the mid-70’s, the College expanded its facilities and instituted more curricular programs. 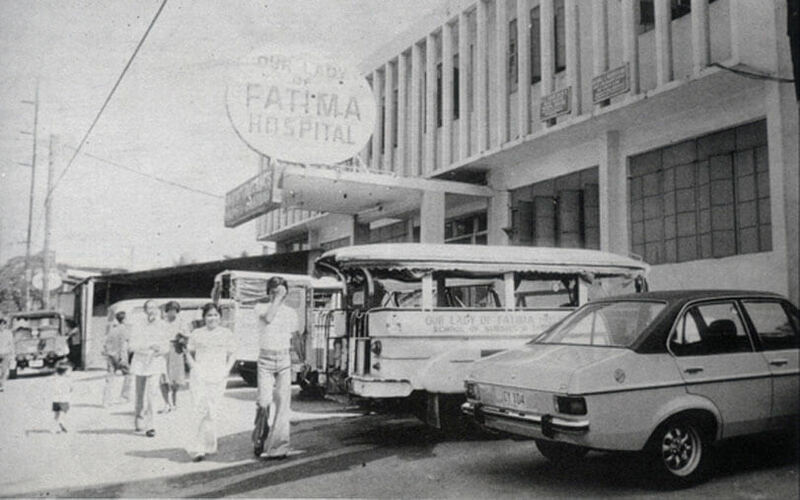 In 1979, Dr. Vicente M. Santos, together with his wife Mrs. Juliet Olivares Santos, pursued the vision of Mr. Olivares even further by establishing the Fatima Medical Science Foundation, Inc. – Fatima College of Medicine. Since then, Fatima College of Medicine has made its mark in medical education by producing holistically-empowered graduates who are consistent Medical Board topnotchers and highly respected medical physicians. In the 1990’s, a more progressive and responsive perspective was embodied by Fatima Medical Science Foundation, Inc. and Our Lady of Fatima College. As a response to the changing social and technological environment, the college engaged in new academic programs particularly in technology, maritime education, and business while at the same time fortifying and improving its performance in the paramedical courses, which Fatima is known for. EARLY RECOGNITIONS. In its journey towards academic excellence, Our Lady of Fatima College received official recognition by achieving accredited status in its Nursing and Physical Therapy programs by the Philippine Association of Colleges and Universities Commission on Accreditation (PACUCOA). The Association of Christian Schools, Colleges and Universities (ACSCU), another prestigious accrediting body, would eventually give its mark of excellence to our Graduate School programs in MA in Nursing, MA in Educational Management, MA in Teaching, Master in Public Administration, Master in Business Administration, together with our undergraduate programs in Psychology and Biology. Fatima Medical Science Foundation- Fatima College of Medicine was also accredited by the Association of Philippine Medical Colleges, the New York State Board of Education and the Illinois State Board of Education. The College of Maritime Education, in turn, was ISO certified 9002: 1994 and included in the Commission on Higher Education’s White List (in 1998) as a qualified provider of maritime education. EARLY EXPANSION: QUEZON CITY. The next five years further saw a dramatic increase in infrastructure development. Modern buildings were established in Valenzuela City. OLFU made its presence known in Fairview, Quezon City with its new campus overlooking the La Mesa reservoir. In 1996, the institution started to offer two programs, the Bachelor of Science in Physical Therapy and BS in Occupational Therapy and the students were housed at Fatima Physical Rehabilitation Center and Eye Clinic at Regalado, Fairview, and Quezon City. On the succeeding year, the program offerings increased, namely BS in HRM, BS in Tourism, BS in Psychology, BS in Biology, BS in Nursing and BS in Computer Science. With the increase of the programs, OLFU expanded the infrastructure to Hilltop, Lagro with an eight storey building, the College of Arts and Sciences Building. In 2001, another building was constructed, the Saint Jerome Building. In the succeeding years, the institution further offered more programs namely BS in Education major in English, BEED major in Preschool Education, BS in Information Technology, BS in Criminology, BS in Pharmacy, BS in Medical Technology, BS in Entrepreneurship, BS in Business Administration major in Marketing Management and other Allied Sciences and Health Education. In response to the growing population, two more buildings were constructed in Hilltop such as the Vicente Santos Building and the Basic Education Building and one building in Regalado Avenue where the Virtual Laboratory of the College of Nursing is located, particularly. To enhance the students’ athletic and physical fitness experience, the new and complete Athletic Center at Hilltop was constructed last year. It offers state-of-the-art amenities and facilities such as a basketball court, an inner jogging path, a semi-olympic swimming pool and a physical fitness gym. BECOMING A UNIVERSITY. The transformation of the college and conversion to a university in December 2002 was indeed a long-awaited fulfillment of the pioneering dream of the founders of this institution. The installation of Dr. Vicente M. Santos, as the First University President was a fitting tribute to a quiet and simple man whose empowering commitment and devotion to Our Lady of Fatima College inspired and propelled the men and women of the college to move from its humble beginning to its special niche as a premiere educational institution. Indeed, through the years, Our Lady of Fatima University has embraced the basic educational philosophy of “improving man as a man” and emulated the virtues of “veritas et misericordia” (truth and compassion) in upholding the tradition of academic excellence. After the death of Dr. Vicente M. Santos in 2003, Dr. Juliet O. Santos became the second President of the University. Through her unique hands-on leadership, she steered the University to new heights. BECOMING DEREGULATED. Less than a year after becoming a University, the Commission on Higher Education (CHED), recognizing the “enormous contribution of the Our Lady of Fatima University in the growth and prominence of tertiary education in the country and the Asia-Pacific and its commitment through quality education, research and extension work” granted DEREGULATED STATUS to Our Lady of Fatima University through CHED Resolution No. 393-2003 dated October 27, 2003. In 2008, Dr. Caroline Marian Santos Enriquez became the Third University President after the death of Dr. Juliet Santos. She continued to build on the work of her predecessors which resulted to more achievements and recognitions for the university. CONTINUOUS EXPANSION: ANTIPOLO. OLFU’s expansion continued onwards with another campus established in 2008 in Antipolo, the pilgrimage capital of the Philippines. Thus, OLFU Antipolo was launched and just like in Quezon City, the people of Antipolo and nearby towns of Rizal acknowledged the coming of the University as a major provider of quality education. Presently, the Antipolo campus has expanded to four modern buildings built in its sprawling campus overlooking the Metro Manila skyline. COD AND IQUAME. The strong demand for nurses abroad required strengthening the nursing curriculum by infusing the program with state-of-the-art nursing virtual laboratories and simulators first seen in Philippine medical education in a wide-scale mock-hospital setting. These cutting edge technology-driven learning tools offered a wide range of patient scenarios where students can perform an array of diverse nursing procedures. This paved the way for OLFU’s College of Nursing to be designated by CHED as a CENTER OF DEVELOPMENT in late 2008. With the prestige and recognition it has accumulated through voluntary accreditation of its programs within the framework of the Federation of Accrediting Agencies of the Philippines, the Our Lady of Fatima University in 2008, voluntary subjected itself to CHED’s Institutional Quality Assurance Through Monitoring and Evaluation (IQuAME) resulting to, in early 2009, being placed in CATEGORY A(t) as a mature teaching university. UNIVERSITY-WIDE ISO CERTIFICATION. In 2010, the Quality Management System of four colleges, namely, Maritime Education, Dental Medicine, Medical Laboratory Sciences and College of Hospitality and Institutional Management were certified to the ISO 9001:2008 standard. And in June 2012, university-wide ISO implementation was put into place to increase customer satisfaction, improve product quality, and achieve international quality recognition. By October 2012, OLFU was awarded the prestigious ISO 9001:2008 Management Systems certification by the AJA Registrars. This is again an affirmation that the quality of the university’s processes and standards are at par with international management systems. Thus, Our Lady of Fatima University is the first private higher education institution in the CAMANAVA area (Caloocan-Malabon-Navotas-Valenzuela) to have earned the distinction as an Autonomous University, recognized as a mature Teaching institution by CHED (IQuAME Category A(t) as well as having been ISO 9001: 2008 certified university-wide. OPENING OF FOURTH CAMPUS: PAMPANGA. The accomplishments in Valenzuela, Quezon City and Antipolo City have to be stretched further to the north. Thus, the people of Pampanga have become witnesses to this expansion since June 2013. With a new modern building in place right in the heart of the City of San Fernando, furnished with all the necessary learning resources and equipment, OLFU-Pampanga will undoubtedly become a major player in the Central Luzon educational landscape. ANOTHER EXPANSION: NUEVA ECIJA. Before the end of the year 2015, OLFU administrations announced that the University has acquired the Nueva Ecijar Doctors’ Colleges, Inc. (NEDCI), a school located in Cabanatuan City, Nueva Ecija. Just like the other OLFU campuses, its fifth campus promises to offer the people of Nueva Ecija and other nearby provinces the same quality of education and services being provided to students from other OLFU campuses. RISING IN THE SOUTH: Making quality Fatimanian education even more within reach, a new OLFU campus is set to rise in what is known as the “Lion City of South Luzon” – the highly progressive City of Santa Rosa, Laguna. OLFU Sta. Rosa will rise on a four-hectare property in Macabling. This Laguna Campus will initially house a five-storey school building complete with modern amenities, providing a spacious and enriching learning environment for its future students. The new campus is set to open its doors in June 2019.